The world famous Bessey K Body (100% parallel clamps) just got better! The foundation of the K Body family remains the cold drawn steel alloy rail with six serrated edges for secure, slip-proof clamping. Combined with an ergonomic designed dual-composite handle with soft insert, a throat depth of 3-3/4",3 removable jaws pads made of impact and break resistant polyamide designed to protect work surfaces, 2 rail protector pads (easily snap off when not needed) designed to keep clamped material from contacting rail surfaces, and all while achieving and maintaining 1,500 pounds of clamping force. 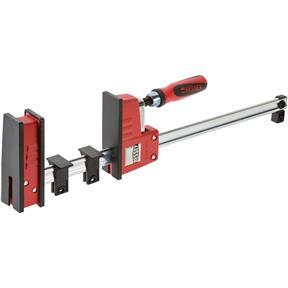 Enjoy rapid action jaw opening and closing by simply raising the handle away from the steel rail and sliding the moveable jaw to a desired point, and adjust the bottom jaw with the push of a button for balance and position to optimize clamping preparation. If you need a spreader, simply reverse the moveable jaw.